Obituary for Addie L. Cloud-McRath | E.F. Boyd & Son, Inc.
Addie Lee Cloud-McRath was born October 27, 1922 in Meridian, Mississippi, as the first-born to the union of Rev. Richard Mattox, Sr. and Maggie Cole. Her parents preceded her in death. Addie was affectionately called "Little Sister" by her family. She accepted Christ and was baptized at age 12 at the Ebenezer Baptist Church in Meridian, where she attended Sunday School faithfully, desiring to know more about her Lord. She attended Meridian public schools, and Meridian Baptist Seminary, and also received a diploma from McMurtry School of Beauty Culture. She later moved to El Paso, TX, where she worked faithfully in the Sunday School, served as Children's Choir Director, and was a member of the Senior Choir in Visitor's Chapel A.M.E. Church. In the early 1960's Addie moved to Cleveland, OH where she earned a degree as a Licensed Practical Nurse (LPN) from Jane Addams Vocational School. Additional activities included studies at the Cleveland Institute of Music in voice, voice theory, and the pipe organ. After living in Cleveland for a number of years, Addie was united in marriage to Mr. Grady H. Cloud, who was her encourager in all her undertakings. 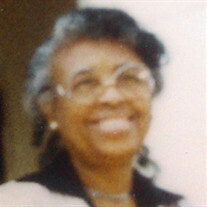 She became a member of the Bethany Baptist Church, where she continued to serve in the Sunday School and Senior Choir. A call to serve as a church musician prompted her to move membership to the Community Baptist Church under the pastorate of her brother, the late Rev. Richard C. Mattox, "where I learned so much about my Savior, the Lord Jesus Christ." There she served in the Sunday School, and as organist and Senior Choir Director. Motivated by the desire to "never stop learning," she earned certificates for the Evangelical Teacher Training Association classes (now ETA), and also attended Moody Bible Institute's Extension School (now Moody Distance Learning). Following the death of husband Grady, Addie resided for several years in Oakland, California, where she was a member of the Evergreen Baptist Church; there God used her in a mighty way to teach the Word, in the music department, children's church ministry, VBS, BTU, WMU. After returning to Cleveland, Addie was united in marriage to the late Mr. Charles Lee McRath, and he became her cheerleader in all her undertakings. She lived out her dedication to continued learning by enrolling at about 75myears of age in computer courses at the Cuyahoga Community College. Many family members and friends witnessed her mastery of 20th and 21st century technology from her emails and the Power Point projects she created. Addie Lee Cloud McRath will be lovingly remembered by her Sunday School students, the numbers of which span 7 decades; her generous support of Christian ministries and humanitarian causes; and her quest to continue learning. Addie passed from death to eternal life on May 1, 2018, at the Shaker Gardens Nursing facility in Cleveland, OH. She was preceded in death by her siblings, Richard Cole, Eugene, and Emma Mae. Addie leaves to celebrate her life, a beloved sister, Ernestine Holliday of Meridian, Mississippi, and a beloved host of family members, church family, and friends.